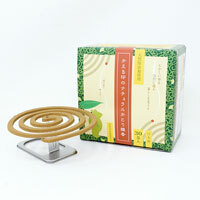 Kaeru Series Natural Mosquito Coils are made using 100% all-natural ingredients, with pyrethrum as the primary active ingredient, and therefore their smoke is very gentle. Enjoy an evocative fragrance that will envelop you in the aroma of fresh white chrysanthemum blossoms. Please do not leave burning incense coils near bedding, clothing or other flammable materials. Please do not leave directly on or close to recently painted walls, furniture, flooring or other objects whose colors may be easily altered. Please dispose of accumulated ash after having allowed it to cool. Avoid exposing the incense coils to direct sunlight, and store them in cool place with little humidity, out of the reach of children.